YES! We sell Chalk Paint® ON-LINE! Click "BUY PAINT ONLINE HERE!" below!! 585.750.6056 OR visit ONE of our FOUR stores! Can I paint over Chalk Paint® later if I change my mind about the color? Sanding Chalk Paint® Before OR After Waxing? Paint Delivery- get it in from the hot or cold ASAP! How did we get our business name? 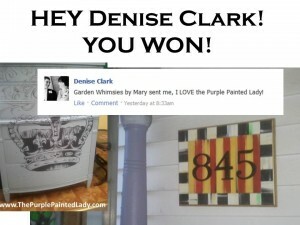 Denice Clark Won the Whimsical Wednseday GIVE A WAY! Thank you to my friend Garden Whimsies by Mary. Mary has a passion for repurposing thrift store “treasures” into unique, one of a kind garden art. They are the added “bling” every garden deserves. No matter what your garden style is …from formal, eclectic to cottage, a garden whimsy is the perfect garden accessory. Her designs include: Garden totems, centerpieces, garden stakes, plate flowers, wind chimes and home accessories. Mary’s whimsies were recently featured in the Outdoor Living 2012 issue of Valley Homes & Style Magazine. Mary shares tips for creating your own whimsies via her Facebook page, website and blog. Mary and I partnered on introducing some of our Facebook friends to one another! Colleen Lang from my page was the lucky lady who was chosen to receive this beautiful whimsical pedestal stand! 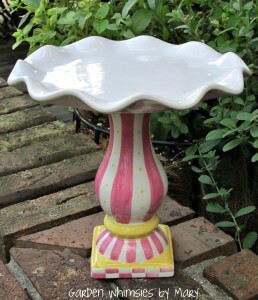 It would be perfect for holding cupcakes, jewelry, candles or pretty soaps in the powder room. All you need to do are three simple things: 1) show her some LOVE by visiting her page and LIKING it. 2) Leave a note on her page saying “The Purple Painted Lady sent me”. 3) Then, leave a note on my Facebook as a comment to this posting stating “You LOVE Garden Whimsies by Mary”. And The Purple Painted Lady in turn gave a way a free custom house plaque! Denise Clark from Garden Whimsies by Mary‘s page won it!!! This entry was posted in Customers, Promotions by Tricia. Bookmark the permalink.